"Go out and make someone smile." Patricia Love is 5 star Realtor® and mentor of Real Estate for 27 years in the Bellevue/Seattle Area of Washington State. Her goal is to provide the best service, so you will happily refer her to your friends, family and co-workers. In addition, Patricia has a complimentary real estate service for buyers and sellers that matches top Realtors® and agents with potential home buyers and sellers from her vast network of connections across the United States and Canada. If you’re moving or relocating Patricia will personally match you to the best of the best Realtors® and can guarantee you have a positive experience. She provides education, strategies and invaluable tools throughout the transition/transaction process with her complete package of services. Excellent service, communication and support have always been a top priority during Patricia’s 25 years of real estate experience. By setting high standards through her nationwide referral service, she matches buyers and sellers ONLY to realtors that meet her exceptional guidelines. Did you know there is a 78% chance you will choose the wrong Realtor® and have a negative experience when buying or selling a home? YES 78%! Don’t be a statistic during one of the biggest transactions in your life! Are you willing to take that gamble? If not, call Patricia today and she will guarantee you will have a positive experience. She will find you a qualified, top realtor who fits your needs, provide on-going tools and incomparable support! Ready for the best part? This is all at NO COST to you! Guaranteed! Patricia loves sharing her experience and does it with everyday inspiration and positivity! She loves her work everyday as she is always #MovingPeopleWithHeart. "What I do...is Real Estate, but who I am...is living life in a positive way, and giving value in what I love to do each day. I believe that education, extraordinary service and communication can uplift every relationship and every transaction. I am in the real estate industry because I care and want to assist you above and beyond your expectations." So if you are in need of a Top Realtor® or need a mentor/coach to increase your sales and motivate positivity into your life contact Patricia today. Did you know 70% of people pick the wrong realtor and report having a negative experience when buying or selling a house?! YES 70%. If not, call me today and I will guarantee you will have a positive experience. I will find you a top realtor;(from my vast network of realtors nationwide) who fits your needs, provide on-going tools and incomparable support! Ready for the best part? This is all at NO COST to you! Guaranteed! 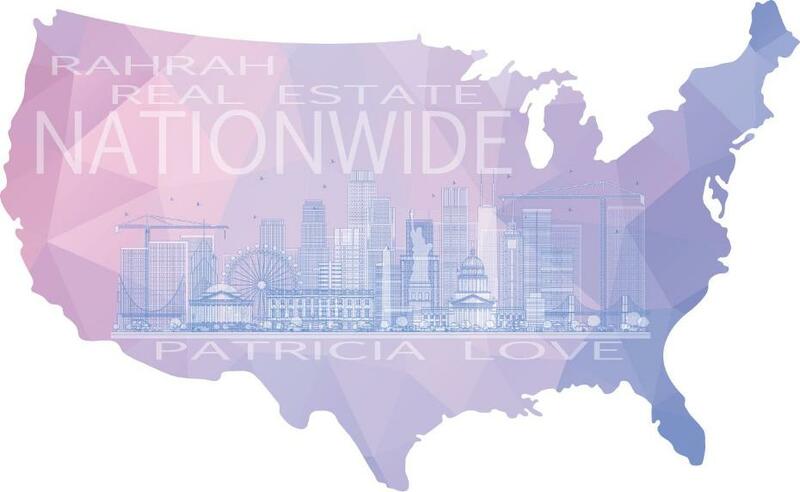 Patricia Love’s RahRahRealEstate.Love is a Complimentary Real Estate Service for buyers and sellers nationwide. Patricia matches top agents to buyers and sellers unique and specific needs. She provides education, strategies and invaluable tools throughout the transition/transaction process with her complete package of services. Excellent service, communication and support have always been a top priority during Patricia’s 25 years of real estate experience. "I believe that education, extraordinary service and communication can uplift every relationship and every transaction. I am in the real estate industry because I care and want to assist you above and beyond your expectations." Patricia believes in positive experiences and loves her work where everyday she is #MovingPeopleWithHeart ! At “RahRah” Real Estate, we have never lost sight that the word “serve” is at the root of service. When you choose to work with us, know that we set the bar high. For real estate referrals we match buyers and sellers ONLY to realtors that meet exceptional guidelines. To experience our packaged complimentary concierge services, please fill out the appropriate form below and we’ll be in touch within 24 hours. Across the world or across the street, I am your Real Estate agent Matchmaker! “RahRah” Real Estate will personally match your wants and needs to the Top 3% real estate agents across the world. I am a Certified Residential Specialist (CRS) and have access to an exclusive global 30K+ database, which includes my own personally interviewed agents around the world. Whether you are a buyer or seller, simply fill out the form below and let “RahRah” Real Estate do the work for you. My “matchmaking” services are at NO COST TO YOU! By choosing “RahRah” Real Estate, your clients will be in the best of hands, and you also will receive updates so you know where we are in the process! Your clients will experience the best in service, and a positive and guided experience. Thank you for entrusting us with your clients! Just fill out the form below and we will be in touch with you within 24 hours. By choosing “RahRah” Real Estate, you will be in exceptional hands. We are your one stop shop, and we want to take the stress out of buying! Life is too short to be stressed out...Let The “RahRah” Agents show you the positive side of buying real estate! RahRah! Are you looking for a qualified agent outside of Washington state? I am a Certified Residential Specialist (CRS) and have access to our exclusive global 30k+ database — just let me know, I’d be delighted to help! We’re ready to talk whenever you’re ready to talk! Please fill in this short form, and we will be in touch with you within 24 hours… If you’re in a hurry, simply gve us a call at 425-202-6235. By choosing “RahRah” Real Estate, you can be confident that you’ve chosen well. We are your one stop shop, and we want to take the stress out of selling! From staging to closing let the “RahRah” Agents take care of it for you, life is too short to be stressed out. At no cost to you as a seller, we are very happy to refer you to a Top 3% real estate agent if you are outside the Washington state area. I am a Certified Residential Specialist (CRS) and have access to our exclusive global 30k+ database — just let me know, I’d love to help! Let’s talk — we love being interviewed. Fill in this short form, and we will be in touch with you within 24 hours… In a hurry? Give us a call at 425-202-6235.
speaking Patricia is an International Edu-Tainment Speaker. She loves to motivate and teach realtors and small business entrepreneurs how to sell by referral. She does this through her stories and a bit of humor. She will motivate you to turn any obstacle or failure into your friend! Patricia is The Consummate Cheerleader, and will motivate you to get your “RahRah” on daily! Life is full of ups and downs, obstacles, failures and opportunity, we all have our own story, and all of our stories matter. Happiness is about finding your happy place within. As a Realtor® mentor, and coach, I have had my own share of ups and downs, and these 5 diamonds are a result of those. They are my 5 steps to becoming happy, and they are my Gift to you. Give them a try, because you deserve, to be your best YOU. inspiring I love inspirational reminder quotes! They motivate me and create a positive day! You will find some of my personal quotes along with my favorites from others, please feel to share. I want to add to the positivity in the world - let's get motivated and share the LOVE! Let's get people “RahRahed”!